What is the output resolution in dots-per-inch (DPI) of the KODAK Picture Saver Scanning System? The KODAK Picture Saver Scanning System (any of the PS batch scanners as well as the flatbed accessories) is capable of scanning at 300, 600 or 1200 DPI with a native or optical resolution of 600 DPI. What is the ReTouch feature? The ReTouch feature applies KODAK PERFECT TOUCH technology to correct the effects of dye fade, and enhance color balance, contrast and brightness. How many photos can be placed into the automatic feeder of KODAK Picture Saver scanners at one time? 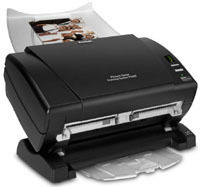 The KODAK Picture Saver Scanner PS410 and Scanner PS450 can accommodate up to 25 photos. 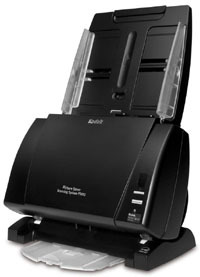 The KODAK Picture Saver Scanner PS810 can accommodate up to 100 photos, depending on the thickness and condition of photos. Since the scanners pull the photos at the bottom, additional photos can be continuously added to the top of the batch during scanning. What print sizes can be scanned using the KODAK Picture Saver Scanning System? Can the KODAK Picture Saver Scanning System handle fragile photos? What output formats are delivered by the KODAK Picture Saver Scanning System? Scanned photos are saved as JPEG files (.jpg). Specifically, the files are saved as 24-bit RGB color and the compression quality is defaulted to Best. The PS810 application also allows users to save scanned photos as single- page, uncompressed TIFF files (.tif). What is the average file size of images produced by the KODAK Picture Saver Scanning System? How can I tell how many images were scanned for an order? The KODAK Picture Saver Scanning Software stores an xml file in the folder for each order. The file contains the count of scanned images along with order details. How should I prepare photographic prints? To ensure the prints are clean before scanning, use a canned air duster or gently clean with a microfiber cloth. 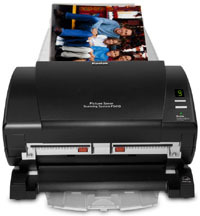 Photos with adhesive substances should be scanned with the KODAK A3 or A4 Flatbed Accessory to prevent transfer of the adhesives to the KODAK Picture Saver scanners. Can I use the KODAK Picture Saver Scanning System for document scanning? Yes. At installation, Smart Touch software with easy-to-use document scanning functionality is installed along with the KODAK Picture Saver Scanning Software. You can launch Smart Touch from the system tray or by pressing the buttons on the front panel of the scanner. What are the maintenance recommendations for the KODAK Picture Saver Scanning System? For best results it is suggested that you clean the scanner glass thoroughly once a day and between orders to remove any debris that older photographs may leave behind. Follow the instructions in the User Guide using the recommended cleaning materials and accessories. Are there any issues installing the Kodak All In Home Center Software on the same PC with the Kodak Picture Saver System Application software? Installing or upgrading the All In One Printer Software on the same PC as the Picture Saver Scanning Software may remove the registry entries for the Picture Saver scanners (PS410/810, PS450, s1220). This will incapacitate the Picture Saver Scanning Software. Most likely, the Picture Saver product registration screen will appear instead of the application's splash screen, and you will be prompted to register the product. If this occurs, re-load and re-register the Picture Saver Scanning Software. What is the difference between the two separation modules provided with my KODAK Picture Saver Scanning System? The KODAK Picture Saver Scanning System is shipped with a KODAK Standard Separation Module and a KODAK Gentle Photo Separation Module. The Standard Separation Module is recommended for use with documents as well as photos that are difficult to separate. Refer to the User Guide for installation instructions. What are the software installation requirements? There is no need to uninstall previous versions of the Picture Saver Scanning Software, the installer will automatically update the currently installed version if one exists. If I uninstall my KODAK Picture Saver Scanning Software, will I lose the photos that I have scanned? No. Your JPEG (and TIFF on the PS810) image files will remain stored on your hard drive. What do I do if my hardware key does not work? If you have problems with the hardware key, call the Kodak support center. The Kodak support center representative will diagnose and provide instructions to resolve the problem. How do I replace a lost hardware key? Lost or stolen keys can be replaced at a reduced price while the KODAK Picture Saver Scanning System is under a Service Maintenance Agreement. Call the Kodak support center for details on replacing a lost hardware key. You will need a proof of purchase to request a replacement. During installation of the KODAK Picture Saver Scanning Software, what should I do if I already have another product installed that uses the same kind of hardware key? During software installation you may get a prompt that asks, “Do you want to keep your current version of WIBU software?” Please select to install the version from the KODAK Picture Saver Scanning Software CD. Do not install older versions of WIBU software on the PC as that may disable the WIBU software for the KODAK Picture Saver Scanning System. What is a wk1128 wkwin32.dll error? This error message occurs if you did not install the WIBU software that is on the KODAK Picture Saver Scanning Software CD. If you receive this message while trying to use the KODAK Picture Saver Scanning System, reinstall the Picture Saver Software and, if prompted, select to install the WIBU software. The software upgrade will automatically install the correct version of the WIBU software.